It helps to gain maximum vascularity and prominent muscular definition. How Much Chicken Per Day Require For Bodybuilding? Chicken is the affordable source of protein. It is favorite food with cooking versatility such as bake, grill, stir-fry or steam. A bodybuilder should eat only chicken breast as it is an excellent protein food for bodybuilding. During bodybuilding exercise, counting chicken consumption is worth. If you are an average individual of 76 kg, you need to eat at least 200-gram chicken per day. Without knowing the amount of required chicken, you may put yourself at risk of fat gain. Later you may look like a Sunday league player after a stag night. Eating 200-gram chicken breast can produce daily recommended dietary allowances of protein: 0.8gram per kilo body weight. According to Matt Lovell (sports nutritionist), If you have a protein deficiency, you may face difficulty in building muscle tissue. Apart from protein, chicken has more quantity of selenium which is 39% of per 100 gm RDA. The selenium is an essential mineral which helps to build muscles. According to Edinburg University, selenium boosts fertility health. 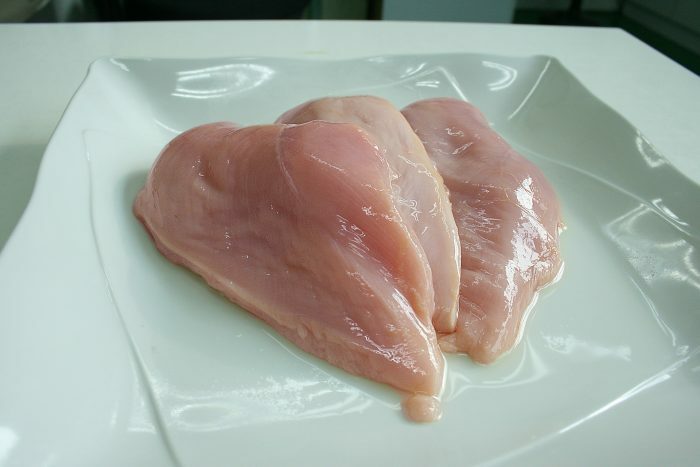 Eating chicken breast can help your heart health. You can have 36% of RDA, vitamin B6 from a chunky chicken sandwich. Sometime, getting involved with chicken breast may make you turn down. Before eating chicken remove the skin. The chicken skin contains extra saturated fat, which causes to raise cholesterol levels. It may cause 27% of a coronary heart problem. A bodybuilder Lovell suggests to eat per day 2.2 gram of protein per kilo body weight. That is nearly 500 gram chicken for 76kg man. Mixing your sources of protein is essential for bodybuilding. You can have stir fry chicken with tuna salad in lunch. You can add some pine nuts to get 14 g extra protein per portion. Overeating chicken will cause lack of other nutritional benefits. A bodybuilder should not ignore other protein sources such as red meat, fish, and eggs. Other sources of protein provide a right amount of iron to help immune system B12 boost energy metabolism. You can have grilled tuna in dinner for lean protein. According to Manchester University, Vitamin D found in tuna helps to sharpen the mental process. Don’t overeat the chicken, which will go to waste. The body uses only the required amount of protein and remaining will eliminate as waste. So, keep in check your chicken intake for better bodybuilding. An individual with 50 kg needs 100-grams protein. If the individual is taking only chicken for the protein source, then he should eat 350-gram chicken. If u eat 350 gram chicken = 105gm protein (for 50kg boy). If an individual weight 80 kg and eating 1000gm chicken. Entirely depends on the requirement of protein and muscle building size. For an average bodybuilding requirement: If a person weight 75 kg needs to eat 250 – 500 gram chicken per day for bodybuilding. There are different cuts of chicken such as chicken breast, wings, drumstick, and thighs. These all cuts have a distinctive amount of protein. Chicken breast is an essential cut of chicken. If 172 gram of chicken breast cooked without skin, will provide 54 grams of protein. It is similar to 31-grams protein per 100 grams. A chicken breast contains 165 calories per 100 grams. In the chicken breast, 80% calories come from protein and 20% from fat. Chicken breast is a valuable food among bodybuilders. It helps to lose weight without worrying about more calories. Gaining muscle mass depends on the intake of more calories and weight training. If you eat calorie surplus with more protein without exercise, then you will get only fat. With protein and calories, muscles need carbs, glycogen, and fat for maintaining essential hormone functions. Chicken thigh is cheaper than chicken breast. One boneless and skinless chicken thigh contains 13.5 gram of protein. It is equivalent to 26 grams of protein per 100 grams. Per chicken thigh contain 109 calories or 209 per 100 grams. Chicken thighs are darker than chicken breast. Chicken legs are more active and have myoglobin. As compared to chicken breast, chicken thigh cannot fulfill the required amount of protein for bodybuilding. Therefore, you can consider a chicken thigh as an option only sometimes. There are two parts of chicken leg: thigh, and drumstick. The lower part of the chicken leg is drumstick. It is also known as a chicken calf. A chicken drumstick has 1.4-grams protein. It is equivalent to 28.3 gram of protein per 100 grams. The chicken drumstick has 176 calories per 100 grams. Chicken drumstick contains 15-grams fat, which is more than chicken breast (3-gram fat). Apart from fat, the chicken drumstick is challenging to measure, as it has bone also. As compared to the chicken breast in size, drumstick measurement is hard to find after cooking. If you cook chicken breast, you can easily measure it because it is only pure meat. Therefore, you will get an idea of how many grams you need to eat. Regarding drumstick, for getting some protein, you need to eat 4 – 5 drumstick which make you feel you are eating lots of chicken. Instead, if you eat chicken breast, it will give you proper portion size. Therefore chicken drumstick is not recommended for bodybuilding. But you can have it sometime as it is delicious too. Chicken wings have three parts, such as wetter, drumette and wing tip. Chicken wings are considered a snack. A medium baked chicken wing with skin contains 86 calories, 6 gram of fats, 0 carbohydrates, and 3-gram monounsaturated fat and 2-gram saturated fat. It also contains only 6-gram protein. That’s why it doesn’t fulfill the requirement of a bodybuilder. But still, you can have the delicious chicken wings as a snack sometimes. Which Chicken Cut Provide Maximum Benefit? Eating a specific part of the chicken is depending on the requirement of your health and bodybuilding goals. The whole chicken is the best source of protein, but some parts are lean. The excess fat contains in drumstick, wings, and thighs may benefit few fitness goals but hinder the bodybuilding plan. Only chicken breast is the best cut of chicken, which has low calories and more protein. Why Do You Need To Eat Chicken Breast For Bodybuilding? Are you looking to build muscles or burn fat? For doing both, you should not cut an essential nutrient called protein. Skinless chicken breast is necessary for a protein required for bodybuilding. A bodybuilder’s diet should contain a right amount of chicken all time such as breakfast, lunch, and dinner. Why because chicken breast has more protein and a small number of carbs or fat. So, if a bodybuilder is preparing for the contest, chicken breast is the thing to get help. Chicken breast is an excellent choice for lean protein. Mainly it is a piece of skinless and boneless chicken. Chicken breast is a particular food for bodybuilding. Additionally, chicken breast provides excellent health benefits. Per half chicken breast have only 142 calories and 3-gram fat. Its nutritional facts show, there are no sugar, fiber, and carbs. You can also get vitamin B6, E, and B12. Chicken is standard meat throughout the world. It is essential and found exciting food in fitness and bodybuilder enthusiasts. Pure protein in chicken helps to maintain muscles and lose fat. Understanding chicken breast calories can be tricky. The calorie count depends on the chicken breast size. One serving chicken breast is equal to 3 ounces or maybe your palm size. Whereas, the commercially packed chicken breast are large. Therefore, if you eat one chicken breast, it can be more than one portion. Eating chicken breast with skin increases the fat and calories. A full chicken breast contains 55-grams protein, 366 calories, 14 grams fat, 4-gram saturated fat and 132mg sodium. The chicken breast cooking techniques and flavoring may add the difference in nutrition. Rotisserie chicken contains 170 calories in three ounces. Apart from that, it contains 11 grams of fat, 1 gram carbohydrate, and 15 grams protein. A medium fried chicken breast contains 13-grams protein, 374 calories, 13 grams carbohydrate, 697 mg sodium and 18 grams fat. Make a good choice of chicken breast for cooking. Purchase an excellent clean and pre-trimmed chicken breast which is ready to use. While shopping at grocery stores, you may get the frozen chicken breast, which is individually packed. If this is the only convenient option you have for buying, do check the nutrition facts on the wrapper. These kinds of the chicken breast may contain more sodium. While cooking chicken, make sure you cook the chicken by maintaining its internal temperature for food safety. You need to keep 170-degree Fahrenheit for boneless chicken. The 180 degrees Fahrenheit temperature should reach the bone in chicken. Make sure to clean the cooking surface for raw chicken. During a bodybuilding program, you can have boiled chicken, which gives health benefits. You need to choose a soft and fresh chicken to avoid rubber-like texture. If you prefer a clean and soft chicken, it will remain tender. Sometimes it becomes bland and tasteless. But for regular consumption, you can try the variety of delicious and tasty recipes. While buying chicken make sure it’s cleaned properly and there is no blood on meat. If blood remains on chicken, it will become a blood clot after freezing which is not healthy. In a large pan fill the cold water and add chicken. The chicken should cover entirely in water. Add one teaspoon salt in water and cover the lid. Boil it on medium heat. You can boil the chicken breast for 20 minutes. If you are using chicken with bone, cook for 30 – 40 minutes. For boiling whole chicken keep it on the stove for 1 hour. Chicken is an essential staple for bodybuilding. You can pair it with broccoli, rice or sweet potato. Merely avoid fat contained food for good muscles strength. Eating bland chicken often makes you annoying. So you can try the following recipes. It is savory and sweet flavourful recipes to make your food interesting. This recipe makes preparing in large batches is easy. You can change the portion size according to your muscle building goals. You can eat this recipe on your game day or night party after the game. Concentrating on carbs and sugar, use less honey. The cinnamon filled sweetness can control your post-workout cravings without affecting your progress. Chicken fingers contain a breadcrumb, egg and free of oil. These chicken fingers are 100% delicious. The added walnut’s omega 3, low carbs coating and flavourful texture will calm tempting fast food craving. This recipe is full of flavor. Your chicken gets the smoky, spicy and sweet combination of taste in your plate. During winter when you are unable to grill the chicken, Cup O’ JOE can help to get the flavored grilled chicken. You may love the spicy coconut chicken curry. If you have not tried this recipe, its time try the curry. The curry contains turmeric, which provides benefits such as heart health, blood sugar control, and anti-inflammatory. There are lots of reasons bodybuilders eat chicken every day. It can be protein intake and fat loss or muscle building. With eating chicken per day, a bodybuilder needs to add other good sources of protein and nutrition for better results. Keep exercising regularly for muscle building. You can take fitness trainer help to count the calories and chicken requirements according to your weight and health.